Pressure washers share similar key parts. A gasoline engine or electric motor powers a pump, which compresses water and drives it through a hose to exit from a spray wand or gun at a much higher pressure than when it entered the pressure washer. Beyond the common components, it’s important to understand terms and features to find the best pressure washer for your cleaning jobs. There is no clear winner when it comes to gas vs. electric, as there are pros and cons for both. Electric units are safe to use indoors because they don’t produce harmful fumes. Also, electric motors are usually quieter and require less maintenance than a gas engine. Finally, the user does not need to store or handle fuel for electric pressure washers, which can become an expense over time. With a gas pressure washer, there are often a few different choices when selecting an engine. This allows for a variety of power levels to meet different needs. Also, gas engines don't require a power cord, allowing for more portability and freedom of movement. When it comes to removing caked on oils, greases, and proteins, hot water pressure washers offer a distinct advantage in terms of time, results, and environmental impact. Hot water pressure washers raise the water temperature from about 53°F to as high as 311°F. This allows the working pressure, cleaning time, and consumption of detergent to be greatly reduced. In addition to these benefits, a significant reduction in germs can be observed when cleaning with hot water. For most hygiene requirements, this germ reduction without the use of disinfectant is fully sufficient. Heat is an important factor in cleaning, as it accelerates various chemical processes. With every 50°F increase in temperature, the chemical reaction speed is doubled. Oil, grease, and soot are dislodged by the heat and easier to remove. The emulsion of oil and grease in water is accelerated and heated surfaces dry faster. This means that higher water temperatures can reduce cleaning times by up to 35% – with significantly better results. By reducing the water quantity, a steam temperature as high as 311°F can also be achieved. With the combination of mineral-free steam and pressure, even the most difficult dirt can be loosened. This in turn ensures high cleaning performance, even without chemical additives. The steam stage is perfect for removing bitumen coatings, paint coatings in general, soot deposits, lichens and algae. PSI and GPM are equally important when choosing a pressure washer. PSI refers to the amount of pressure, and GPM refers to the rate of water flow. The correct combination of PSI and GPM in a machine will lead to optimal cleaning results. To clean effectively, a pressure washer produces a "stripping" action to remove dirt and grime. From here, the "flow" moves the dirt away. Think of the pressure (PSI) as the stripping force that is applied to the surface you are cleaning and the flow (GPM) as the rinsing power. Cleaning Units (CU) are the result of multiplying the PSI by the GPM. Cleaning units give the user a measure of unit performance (efficiency) to compare one unit to another. A pressure washer with 2000 PSI and 3.0 GPM also has 6000 Cleaning Units, but the rinsing power is greater than the stripping power. A general rule is that high PSI pressure washers are better suited for removing oils and caked on materials, while high GPM pressure washers are ideal for removing soil and dirt. Thus, GPM is usually more important to contractors than PSI, as most use cleaning chemicals to do all of the cleaning/lifting of dirt. Belt drives are most commonly found on commercial/industrial style pressure washers. A belt driven pump is ideal for cleaning applications that require more than 20+ hours per week. On a belt driven unit, the high-pressure pump spins at a lower RPM, reducing the heat and vibration. This results in minimal wear and tear on the internal parts of the pump and leads to longer life. If using the pressure washer less than 20 hours a week, a direct drive unit may be the better option. Direct drive units turn about twice the RPM as a belt driven unit, but they are usually more compact and easier to transport. This number refers to the power output of a gasoline engine. The powerful the engine, the more powerful the cleaning. This number indicates the power output of an electric motor. The higher the amperage, the higher the power of the engine. The CU or cleaning units is a number determined by multiplying the PSI of a pressure washer by the GPM. The number that results is an excellent indicate the overall cleaning power of any given pressure washer. A RED tip (0°) produces a highly concentrated spray that is very powerful even on a commercial grade inexpensive pressure washer. With this tip you must be mighty careful as it has enough pressure to damage sensitive or fragile surfaces. They are best used to clean concrete and metallic surfaces of caked grime and dirt. Ensure that you do not use this tip close up to the surface. It can even scratch metallic surfaces such as those found on grills and cars. A YELLOW (15°) spray tip is excellent for heavy duty cleaning. It works well with concrete, garage floor, walls and even roofs and drains. However, for detergent based or chemical based cleaning, this is not the most suitable tip as it can cause the chemicals to embed deep within the material’s cracks and crevices. 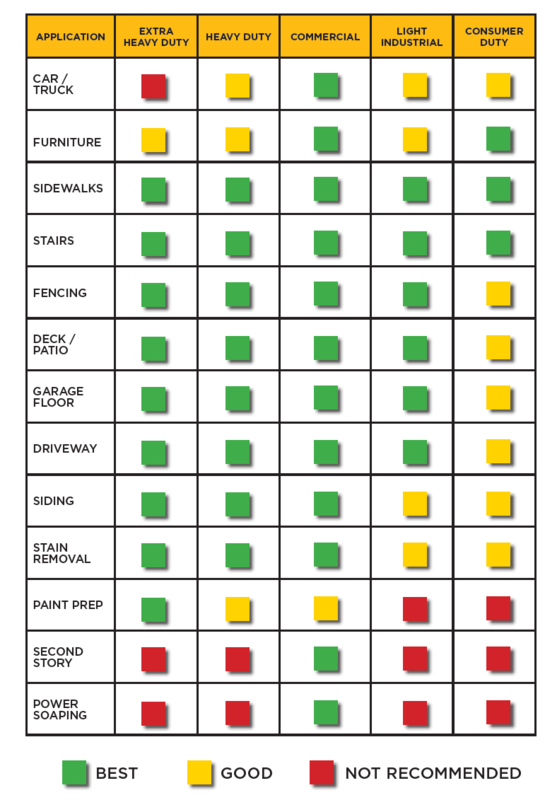 A GREEN tip (25°) is most suitable for cleaning decks, walkways, brick patios and even furniture. Cleaning a boat or ship with chemicals or washing cars with detergent requires a green tip as it produces just the right amount of GPM and PSI required for the job. A WHITE tip (40°) is most suitable to clean delicate surfaces such as stucco walls, home sidings and glossy surfaces. It does not produce a lot of pressure but has got the requisite water flow to get the job done. This tip can be used with just about any kind of surface and with any pressure washer. A BLACK tip (65°) covers the most area with a very gentle stream. This tip is not suitable for cleaning purposes rather it is used to wet surfaces to apply chemicals or detergents. Having the correct nozzle size is crucial when operating your pressure washer. Pressure washer nozzles contain a small orifice which is sized to create the desired pressure at a specific flow. This orifice is a restriction in the water flow. When the flow from the pump is forced through this restriction pressure is created. It is only now that you have a pressure washing system. Pressure washer nozzles with an orifice that is most closely sized to the specs of your pump will give you the optimum performance. 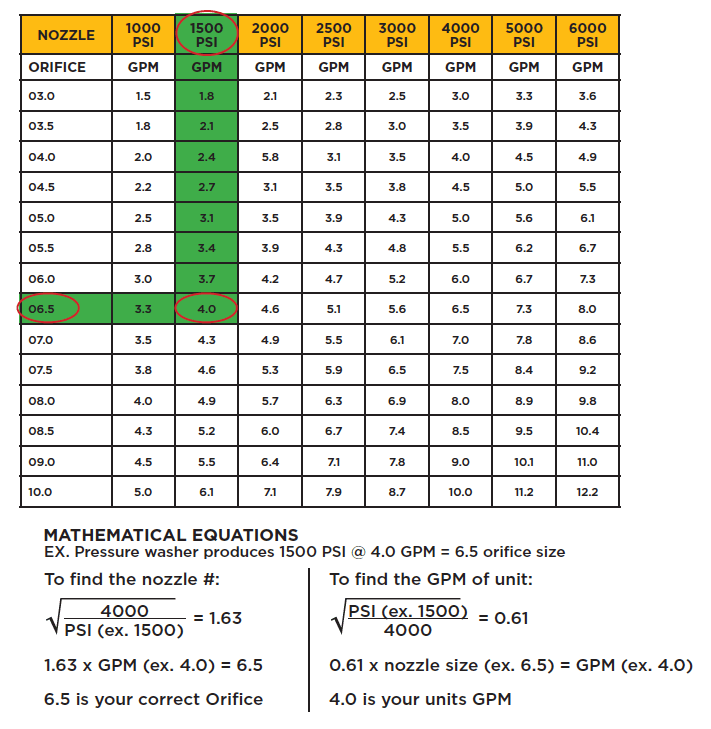 Use the table below to select the properly sized nozzle for your machine. Determine the nozzle size by matching the operating pressure (PSI) of your machine to the gallons per minute (GPM). Oil-level sensors / indicators on gas-powered models help prevent engine damage. Allows use of cleaners and other liquids designed for pressure washers, either from an onboard tank or by means of a siphoning tube. An unloader is a valve system that relieves the pressure when the trigger is not in use on the gun jet. It is an essential piece of the pressure washer, and due to the use and strain it receives, is frequently one of the first part of the pressure washer to wear out. There are external unloaders and built-in unloaders A built-in unloader is built into the side of the pump head. This is the method most modern and home use pressure washers use. The benefits to an internal unloader is that it is a more efficient and durable method, however it is more difficult to diagnose problems and replace if it does fail. An external unloader is more expensive and less prone to failure, but easier to maintain. All pressure washer pumps have pistons and valves similar to a gas engine or air compressor. The pressure washer pumps require 30W non-detergent oil for lubrication. Check the owner’s manual on how to add the oil to the pump. On some pumps the pistons are driven by a plate on an angle (axial pump), and in other cases the pistons are driven by a crankshaft (triplex pump). These pumps are generally built better and will last longer. Axial Pump Style is a Radial pumps that drives 3 -SS pistons back and forth with a wobbled bearing plate design, these pumps carry a 300 hour life expectancy. You will find this style of pump on all of our light industrial models. Triplex Pump Style is a piston type 3 cylinder pump with ceramic plungers moving back and forth in a cylinder inside the pump, driven with a crankshaft and connecting rods. These pumps carry a 3000 hour life expectancy. You will find this style of pump on all of our commercial, heavy duty and extreme heavy duty.